The first time Steve Reich‘s music was the focus of a major remix operation, it culminated in Reich Remixed, a 1999 collection that set the likes of Coldcut, Andrea Parker, Nobukazu Takemura, and others on such minimalist monuments as “Music for 18 Musicians,” “The Four Sections,” and “Drumming.” Of course, this is almost a decade after the Orb worked Reich’s “Electric Counterpoint” into its “Little Fluffy Clouds,” a successful classical-pop graft that made it the Reese’s Peanut Butter Cup of electronica. Nonesuch, Reich’s longtime label, was still coming up to speed on the concept of remixes. At the time, Howie B (then perhaps still best known as part of the quartet Skylab), told me of his experience being invited to participate: “They turned around and said, ‘Can’t you sample off the CD?’ and I went, ‘No, that’s not why I’m doing it. I want to touch on the sounds that were there.’ It’s not like doing a normal remix.” In other words, the label’s idea of a remix was working from the completed track, not from the multitracks, which while certainly common, undermined the creative potential of the contributing musicians. Times have changed, and the understanding of remixing along with it. As of this morning, the pristine, entirely separate, eight constituent parts of the third movement of Reich’s composition “2×5” have been made available for downloading and remixing, as part of one of the remix contests at indabamusic.com. The basic stems set breaks it into eight parts: two bass, two drums, two guitar, two piano. That’s something of a reduction of the original, because “2×5,” as the name suggests, features not eight but ten musicians (two equally matched five-piece rock bands); the stem set combines the two drummers into one track. Don’t despair; there’s also a 20-track advanced set that, true to Reich’s emphasis on percussion, breaks the drum set down even further. The judges for the contest are Reich himself and Christian Carey, who’s a faculty member at the Manhattan School of Music. The due date for participants is November 2. Get the full set at indabamusic.com. 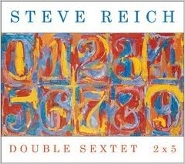 “2×5” had its recording debut earlier this year when paired with “Double Sextet,” which won the Pulitzer Prize for Music last year, in a performance by Bang on a Can (eighth blackbird performs the other work). The past month’s visits to Disquiet.com were the most heavily dominated by MP3s in recent memory, eight of the top 10 being entries in the site’s Disquiet Downstream series of freely downloadable music. The two exceptions were images, (1) one of Ron Arad‘s artwork “Concrete Stereo” (1983), from an exhibit at MOMA in Manhattan, and (2) the other of another sound-art piece, Dale Gorfinkel‘s balloon-powered trumpet (as photographed by Julian Wearne). The eight most popular MP3s were, in no particular order, (3) folktronic pop from Spain’s Bacanal Intruder, (4) a subterranean tour of London featuring Sammie Joplin, (5) an album by Mel on the Chinese netlabel Bypass, (6) synth experiments by Adam Balusik/Room101, (7) a Tony Allen Afrobeat remix by Tim Prebble (aka Subbasshead), (8) Kabir Carter recycling silence, (9) electronic viola loops and drones (by Jordan Dykstra, aka Dash), and (10) mobile soundscapes made available via the Apple iPhone app TweetMic (recorded by Richard Lainhart). 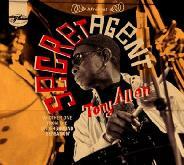 The masterminds behind the remix contest focused on famed Afrobeat drummer Tony Allen (best known as the backbeat of legend Fela’s band) want us to download the 15 constituent parts of the single “Secret Agent,” the title track off his new album on World Circuit label. And no doubt the promise inherent in those tracks will draw in participants. But there’s much pleasure to be had in the raw materials — how often, when you think about it, do we get nearly six straight minutes of Tony Allen drumming, which is freely available here, a trenchant rhythm that’s liked the most stripped-down Meters metric you’ve ever heard? Likewise, amid the emotive backing (and foreground) vocals and syrupy-slick guitars, there’s a fine synthesizer line available all on its delectable lonesome. And for those truly looking to Zen out, there’s even five-plus minutes of a low-volume shaker, rattling along as steady as can be. For those who want to make something of the available mixing-board tracks, the due date for the contest is July 7. More details at tonyallenremixcontest.blogspot.com. More on the release at worldcircuit.co.uk.